(What’s The Story) Morning Glory?, released in 1995, was the band’s most notable album. If you’ve heard of Oasis it’s probably because of that album’s “Wonderwall” or “Champagne Supernova.” That was when I first heard from them as well, even though their first release was actually the fantastically named Definitely Maybe, which came out in 1994. In my mind, Oasis stood out from its contemporary bands like the Goo Goo Dolls, Third Eye Blind, Toad the Wet Sprocket, and the Gin Blossoms. All of those bands had some good tunes, but Oasis’ lyrics consistently had me hooked. While I enjoyed those couple of radio hits in the mid-90s, it wasn’t until Oasis’ release of 2005’s Don’t Believe the Truth that I really became a full-fledged fan. That was a musically significant period in my life, and after listening to Don’t Believe the Truth, I decided that this was a band worth investing more in. 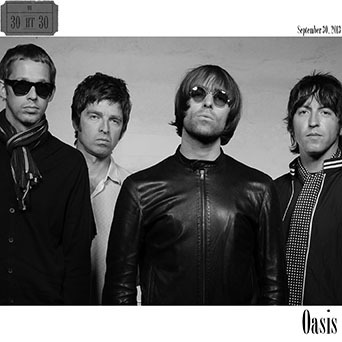 Before I knew it, I had bought every album they had previously released, including Heathen Chemistry, which featured four tracks that show up on this ultimate Oasis collection. Among those tracks is “She Is Love”, a song whose upbeat optimism fit perfectly with my shifting perspective on the world at the time I heard it in 2005. I was shedding the skin of the angst-filled teenage years and beginning to transition into a more mature optimism embracing the possibilities and potential of my 20s. That particular Matt’s Mix ended with “Ooh La La” by The Faces, which features the famous lyrics “I wish that I knew what I know now / when I was younger” proving that my 20-year-old self was, in some ways, much like my 29-year-old self. I imagine those lyrics will continue to ring true with each passing year. But back to Oasis. I’ve bookended the Oasis mix with two songs that stretch more than seven minutes. The first track, “D’You Know What I Mean?” opens with a full minute of noise before the song ever really begins. Eventually the refrain of “All my people, right here, right now / D’you know what I mean?” takes over, and I can’t help but nod my head in approval. Yes, Oasis. I know what you mean.